OpticsFast.com, is the nationwide leader in the repair of any eyewear. It does not matter what brand, model or style, our company can fix it. The repair work is performed by our highly skilled lab technicians who have decades of experience repairing and replacing lenses on eyeglasses and sunglasses. If we can't fix it, nobody can! Authorized Crystal Replacement Service Center for Ray Ban eyewear. 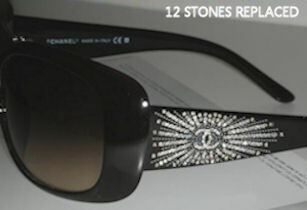 Our specialists are trained in crystal replacement for both Ray Ban sunglasses Ray Ban eyeglasses. There is simply no crystal that we can't replace. If the frame is available to order from Ray Ban , it's very likely that we will be able to order the crystal direct from them for replacement. Ray Ban stocks parts for their eyewear long after the item is even discontinued. If the item is no longer in production, we will match an aftermarket Ray Ban replacement crystal as close as possible to the original one that is missing. Our experts have been doing crystal replacement on Ray Ban eyewear for many years; there is no job they can't do. Some examples of crystal replacements we have done to various brands. 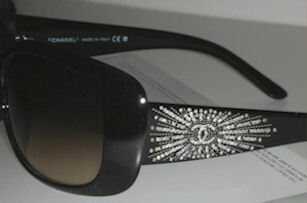 A dozen very small crystals were replaced on these Chanel Sunglasses. This was a very tedious and meticulous job that had to be handled with much care using a magnifying device. As you can see by the below pictures, a total success. 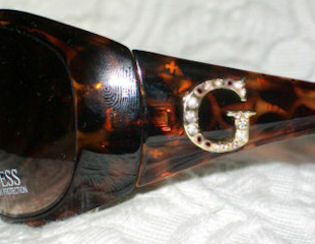 Our customer sent in her pair of Guess Sunglasses to replace four crystals. 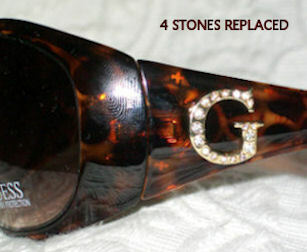 The style of this pair of sunglasses is discontinued, so the lab simply replaced the stones with similar cut and shape from the original. The sunglasses look great. These Prada Eyeglasses came to us with 4 stones missing and 1 of the stones broken in half. Our lab not only replaced the stones, they even matched up the color. These stones where not the standard clear color. They had a yellowish tint. This was not a problem; even colored stones can be replaced without incident. 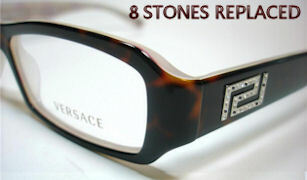 Versace Eyeglasses are elegant and glamorous. That holds true only when all of the crystals are intact. Our customer sent in her frame to bring back that sparkle that she lost when the crystals fell out. Happy to say that our lab helped her achieve her goal. They are back to what they looked like when she first brought them home.